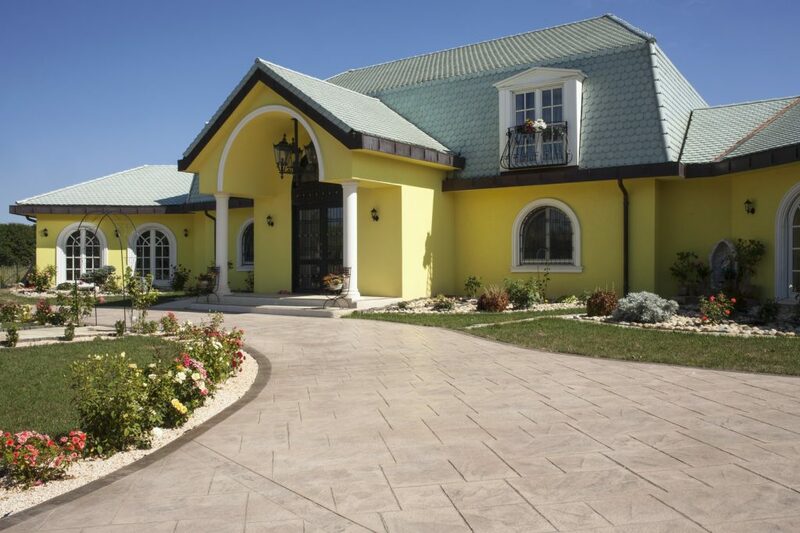 Home / Ideal News / Outdoor stamped concrete floor or interlocking floor: what’s better? Outdoor stamped concrete floor or interlocking floor: what’s better? If you’re planning to remake the floor of your outdoor areas there are two solutions to choose from: the stamped concrete or the interlocking floor. Here is a guide to compare the 2 solutions and figure out which one is more suitable to your house. stone bricks, which are placed dry on the surface one wants to coat. After being laid down, these elements are stabilised and sealed with dry sand. This means that the curbstones interlock without the use of concrete. They need a stable kerb, though, to make the whole surface stable. The stamped concrete consists in a monolithic slab instead. 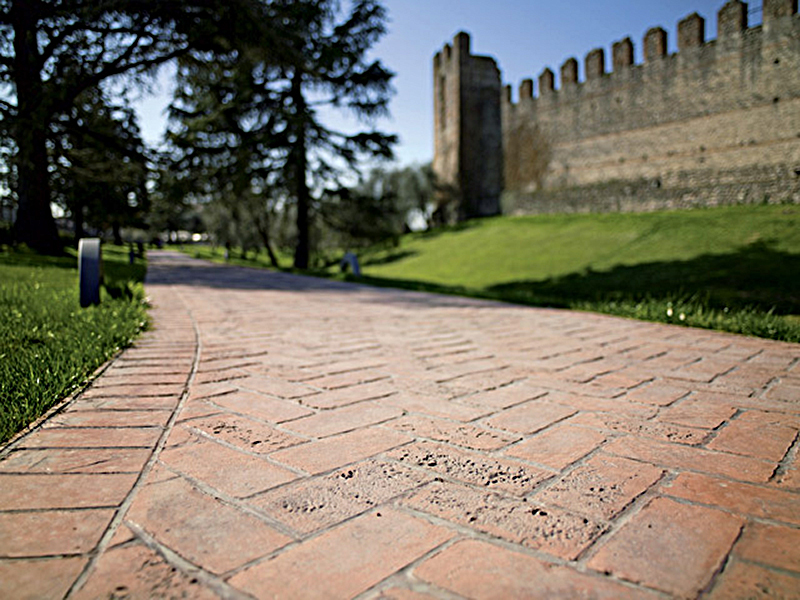 This means it is not composed of bricks, tiles or pre-stamped kerbstones; it is created with a single concrete pouring. The advantage of this solution, compared to interlocking surfaces, is that it is not subject to indentations or settlements. If it deforms over time, the interlocking floor can always be fixed by adjusting the base it lays on. Being a monolithic slab, the stamped concrete floor, on the other hand, is not subject to any depression over time. Creating an outdoor flatwork with moulded concrete gives you free rein to creativity thanks to the countless combinations of textures, colours and fanciful decorations. There are in fact more than 500 possible combinations; the standard colours vary from white to beige to earthenware and seawater. Then you can add to your floor the shade you prefer, from ancient white to charcoal and black. Moreover, the typical geometric and natural effect of the interlocking floor can be reproduced with the textured concrete through the use of specific moulds for concrete, able to give your floor the effect of stone, bricks, cobblestones and even wood. And that’s not all: you can apply decorative motifs, original frames and particular designs such as sundials that last over time. The imprinted concrete floors are suitable for roads, driveways, access ramps and any surface subject to vehicular traffic. Interlocking floors are suitable to vehicular traffic too, but the stamped concrete solution is treated with a particular resin that makes it wear- and abrasion-resistant, as opposed to traditional concrete. An outdoor flatwork coated with stamped concrete is also stain-, absorption-, dust- and mould-resistant. This means it can be used for car parks and garages, garden walkways and porches. This cementitious resin protects the surface from UV rays so that the original colouring stays unchanged over time. The floor colour is the result of the concrete mix itself, and not of the resin coating, which is just an additional protection for the colour durability. With appropriate treatments, this solution is able to withstand extremely hot and cold temperatures, and, furthermore, it can be used in contact with salt water because it is salt- and water-repellent. Both the solutions are suitable for covering small surfaces, such as pooldecks, gazebo areas and car parks, but also for big spaces (hundreds of square meters), such as public areas, theme parks and seashore areas. Compared to the interlocking floor, the application of the stamped concrete floor is a quicker but more complex procedure. 6 – Washing with the monobrush and the pressure washer within 2 days of the application in the warm season and within 3-4 days in the cold season. The procedure for the interlocking floor application is way easier but longer and harder. 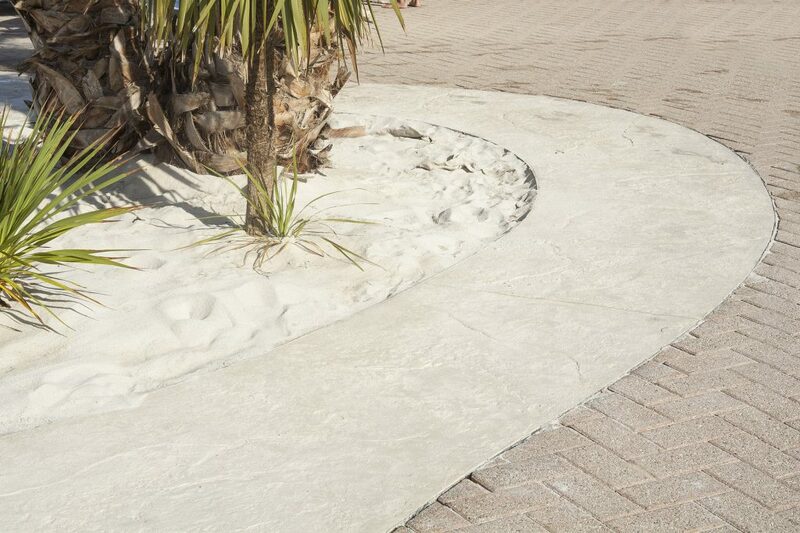 After the coating of the sandy substrate and the kerbs, the single kerbstones are placed manually and, at a later stage, the joints are sealed with a mix of sand and water. The procedure is therefore easier because it only includes the preparation of a sandy substrate and the kerbstones placing on it; there is no use of concrete, nor any protective treatment application. 1 – Ideal Sealer: it’s a clear, acrylic solvent-based sealing and curing membrane for concrete surfaces. 2 – Ideal Fibre: polypropylene fibres, able to prevent the shrinking cracks by distributing the concrete volume uniformly and thus avoiding the possible fissuring. One of stamped concrete’s advantages is its monolithic structure. In fact, being formed by a unique concrete pouring, it consists in an single slab that eliminates the problem of weeds growing between single stones and, above all, the problem of water flows that might damage the floor. Moreover, there’s no risk of single stones detachment, it being a unique, seamless floor. However, as for any other concrete floor, the concrete slab has to be cut to create the dilatation joints. Surprisingly, these joints can be covered and hidden with particular customizable designs and decorations. The interlocking floor is extremely convenient if you have to work on the substrate: all you have to do, in fact, is lifting the stones and then placing them back according to the same system used for creating the floor. Obviously you will have to prepare the substrate again and to pay attention to the various technical adjustments. As opposed to the stamped concrete floor, the interlocking floor is however very sensitive to changes in temperature, to weeds growth and to indentations, so a different maintenance might be required according to various conditions. On the other hand, the stamped concrete floor maintains its esthetic features for years, you can clean it easily with a brush or with a pressure washer by using only cold water and a neutral soap. It is however recommended to take care of it by applying a protective resin coat and to submit it to an extraordinary maintenance every 5-8 years. It is anyway a perfect solution for roads, bike lanes, car parks and theme parks that usually need great maintenance interventions, which might be avoided by choosing this floor. The stamped concrete floor price will depend on a series of factors: the surface dimension, the thickness choice, the additional application of protective treatments, the material quality and the installation time. The final price is definitive, because unlike the interlocking floor, the stamped concrete floor doesn’t need any additional accessories such as kerbs, pits etc to be added to the price at a later stage. The colour and shape customization, through moulds or by hand, doesn’t require any additional costs. The possibility of exceptional maintenance and the application of new protective treatments over time are however to be taken into account when calculating the price on a long-term basis. As mentioned above, this solution is suitable for small or big surfaces and the price changes accordingly, however for surfaces that are smaller than 30 square meters there’ll be a lump sum. Given the wide customization choice, the high resistance and the extremely short installation time, the stamped concrete floors are great for an outdoor application (and indoor too). They are particularly suitable in case of indentations and settlements, heavy vehicular traffic and frequent changes in temperature. Ideal Work recommends this solution for such situations which, more in detail, might be: bike lanes, sidewalks, hotels, shopping centres, campings and theme parks. In 2017 Ideal Work renovated the walkways of Acquafollie, one of the greatest and most famous water parks of our country. In particular, the project provided for the creation of the park’s internal flooring; the solution had to be quick-to-install, water- and wear-resistant and not require much maintenance. Ideal Work created a stamped concrete floor reproducing the stone and brick effects. In 2016 Ideal Work has led a renovation in Veneto’s most ancient museum: the Hermits Civic Museum of Padua. Situated in the Hermit friars’ former monastery, the refurbishment of the external area has been implemented in line with the stylistic coherence of the surrounding buildings. Ideal Work chose the stamped concrete floor with a natural ancient stone effect to integrate with the architecture of the surrounding environment. This quality choice has been a success: thanks to Ideal Work’s innovative products, able to guarantee UV rays-, abrasion-, and heavy traffic wear-resistance and their short installation time, the Museum managed to open again in no time with a new design, perfectly matching the whole building’s style.